In the Hazelwood neighborhood, this “juju” dance band – called Jujuba – warms up before an energetic concert at our outer East Portland regional library. 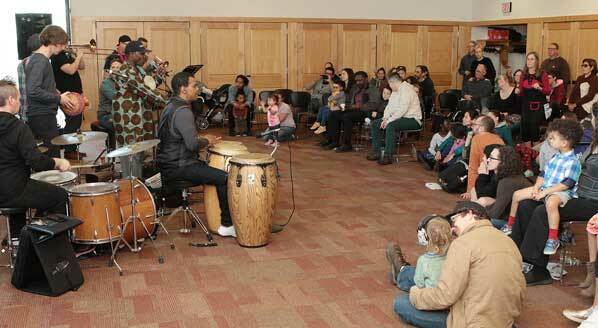 The large meeting activity room at Midland Regional Library came alive with the music of the band “Jujuba” on January 12, in front of a very receptive audience. 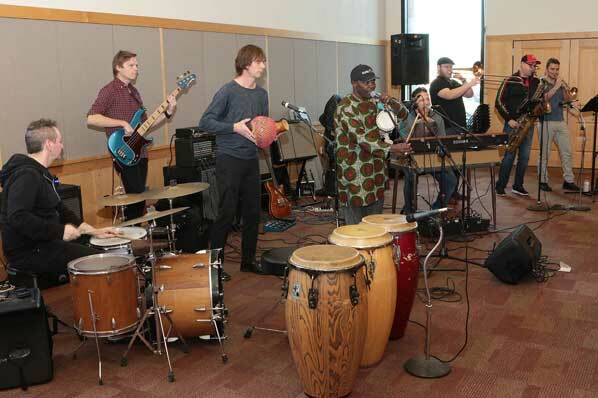 The ten-piece ensemble featured Nigerian “Talking Drum” legend Nojeem Lasisi, with a world-class West African and Cuban percussion section, a blazing horn section, and a funky electric rhythm section. 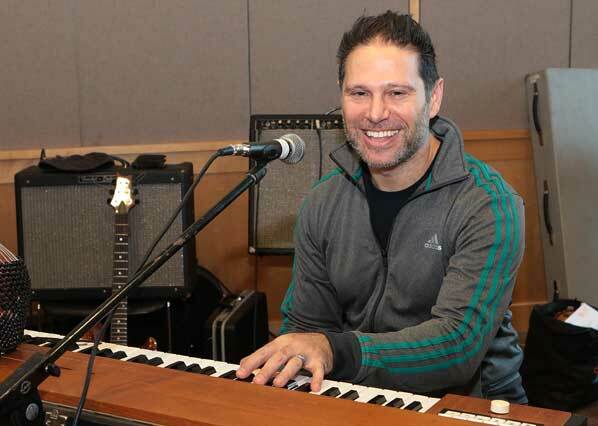 Ready to play some funky rhythms is Jujuba bandleader and keyboardist Marc Silverman. “The genre of music played by our band, Jujuba, is Afro-beat music, and a little bit of Juju music – both are styles of music from Nigeria and west Africa, popularized by the band, King Sunny Adé and His African Beats – and Nojeem was a featured musician with that group for some time!” explained bandleader and keyboardist Marc Silverman. “I moved to Portland 20 years ago with my buddy [guitarist, tenor saxophone virtuoso, and vocalist] Ethan Flaherty – and we wanted to start a band like this,” Silverman told East Portland News. “Eventually the stars aligned, we ended up meeting Nojeem Lasisi, and now we have started one! 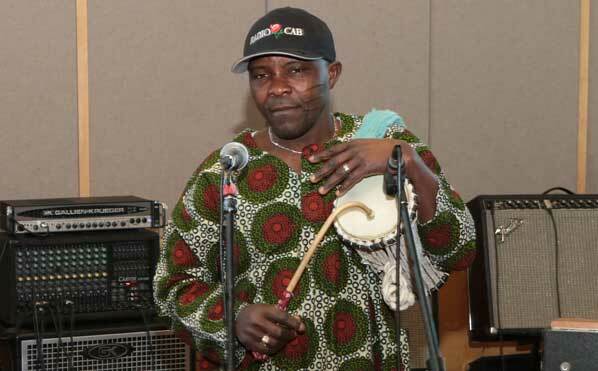 “Talking Drum” master Nojeem Lasisi plays and sings. “While our band plays together a lot, most of the guys in the band work with a number of other bands; and, some of them have full-time day jobs – myself, I’m an elementary school music teacher in Tigard,” Silverman informed. In fact, he added, several of the musicians have been longtime players with the great Portland blues band, Ural Thomas & the Pain. While too bashful to get up and dance with the band, the enthusiastic audience smiles, claps, and rocks to the intoxicating rhythms of Jujuba. As the band began the performance, the room filled to capacity with people – most of them too shy to get up and dance, but obviously thoroughly enjoying the music. 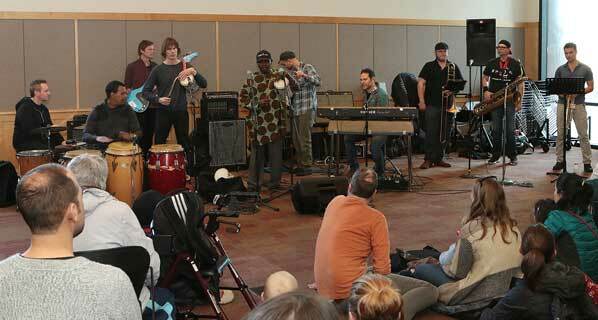 Giving a lively professional concert, Jujuba entertains a room full of folks. The concert was part of the Multnomah County Library program “Everyone Reads”, and it was featuring this book, AMERICANAH, which is available at the library. Hear the music of Jujuba and find out where they’re playing next, by visiting their official website: CLICK HERE.